V.Manikanta (KG) hails from Srikakulam District. He is studying at Sri Sai Model High School, Cherlapally. His mother Jaya expired due to ill health. His father Jayaram married another woman and left his child too. His mother’s sister Sujatha taken care of him during childhood. 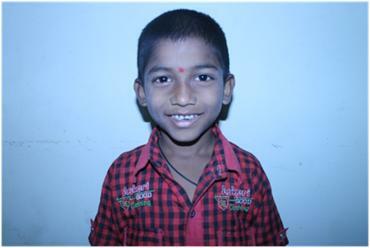 When it became difficult for her to look after him and support education she contacted Sphoorti Foundation. He is an active kid.